Carte des Courones du Nord. 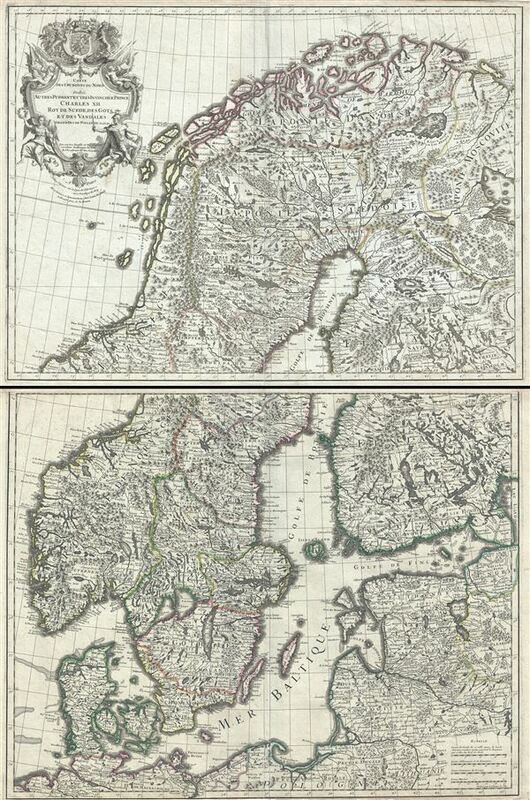 This is a beautiful 1706 two panel map of Scandinavia by Guillaume De L'Isle. It depicts Norway, Sweden, Denmark, Finland, Estonia and Latvia, along with parts of Lithuania, Poland and Germany. The map renders the entire region in extraordinary detail offering both topographical and political information with forest and mountains beautifully rendered in profile. Some coastal features are also included. This map was made at time when the region was in the midst of the Great Northern War (1700-1721). The Swedish Empire was one of the great European powers but at the time was ruled by an inexperienced king, Charles XII. Peter the Great of Russia, sensing a perfect time to win access to the Baltic and the Black Sea, formed an alliance with Denmark-Norway and Saxony and declared war on the Swedish Empire. The war eventually resulted in a Russian victory and ended in 1721. The Treaty of Frederiksborg, signed between Sweden and Denmark-Norway granted Denmark Holstein-Gottorp. A beautifully engraved title cartouche adorns the top left quadrant. The map is dedicated to Prince Charles XII, King of Sweden, of the Goths and Vandals, Grand Duke of Finland etc., by Guillaume De L'isle in 1706. Very good. Printed on two sheets. Minor wear and verso reinforcement along original centerfolds. Minor foxing. Narrow lower margin on bottom sheet.